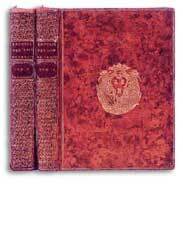 Madame Pompadour had a collection of 3525 books, their bindings were made of red leather and her arms were printed on the covers. In June 16th 2001 68.602 euro have been paid for a book belonged to Madame Pompadour: "Relevons les 450 000 F pour Le Traité des pierres précieuses et de la manière de les employer en parures par Pouget Fils, Paris, 1762, reliure époque Estimations largement dépassées pour ce traité, habillé d'une reliure en maroquin rouge de l'époque, à tranches dorées, aux armes de la marquise de Pompadour." 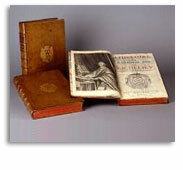 We can try to estimate these books: a small book costs 2300 euro, a medium one 5000 euro. 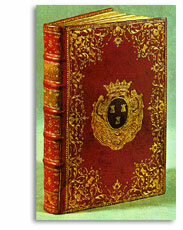 In her private collection there were rare and precious books, so we can estimate a cost of 4000 euro each. The value of the whole library would be: 4.000x3.525=14.100.000 euro. 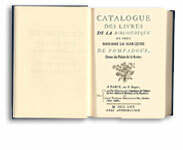 The title page of the catalogue of the private library of Madame Pompadour. J. M. Malzieu, rue de la Banque 15, Paris. This catalogue is still printed, therefore is possible to find it. 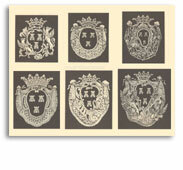 Some of her typical arms printed on the covers of her books. 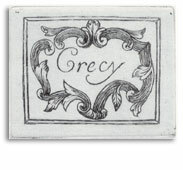 Some of the books have the inscription "Crecy" inside the cover, which sometimes was autographed by the Marchioness. "Histoire memorable, nouvellement & miraculeusement trouvèe en Terre Sainte", by Solan-Chriseriont de Gaule. 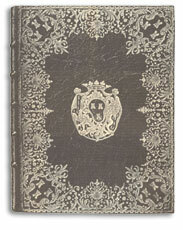 This book has the number 1646 in the catalogue of the library of the Marchioness. "Cours de principaux fleuves et rivières de lEurope", by Louis XV. National Library of France, in the part dedicated to the rare and precious books. Louis XV has always been fascinated by Geography. In 1718 a laboratory was built at the Tuileries where the young King learned the art of typography and printed this collection of geographical lessons ("The flow of the main rivers and watercourses in Europe"). 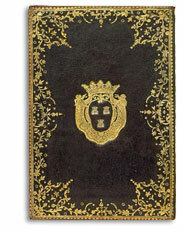 Subsequently the King gave an elegant copy to Madame Pompadour, which she binded with her badge. 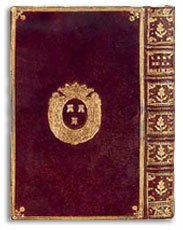 "Lhistoire du cardinal-duc de Richelieu", by Antoine Aubery, edited by Antoine Bernier in 1660. The Versailles Castle and the Trianon. 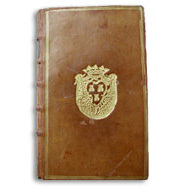 This book belonged to Madame Pompadour. Some typical books of her library. If anyone has news about these books, please write: Mr. Lorenzo Crivellin would love to buy them! "LEcole dUranie ou lart de la peinture, by Alphonse Ufresnoy and Marsy (the abbot). Authors: Ufresnoy (Alphonse) et Marsy (Abbé de). 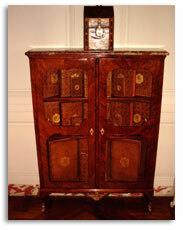 Recueil des Roys de France. Leurs Couronne et Maison. Ensemble, le rang des grands de France.